I haven’t had much luck finding a concealer for spots and blemishes. This can be a problem when you suffer from breakouts. It’s also a problem when you only buy cruelty-free products, because you can’t just pick up anything you fancy when you’re shopping — you have to research it first. Oh, and I’m very pale, so unless I go high-end the chances of finding a decent shade match are slim. But I can’t afford to buy high-end base products on a regular basis because I’m a student. Solid concealer in twist-up stick form. Good. On the yellower side, but this covers redness more. Medium. It can be built up to full coverage if you apply it in light layers, but this looks cakey. Takes some effort to work it into the skin. I use my fingers to apply it because the heat helps with blending. Not the greatest — I usually need to reapply at lunchtime. It’s been discontinued as of 2018. Matte Concealer Stick sounds like a similar alternative. Not amazing, but not bad for a mere £1. Will do the job if you’re on a very strict budget. Green liquid corrector in a pen. You click the end to release more product and use the built-in brush to apply it. It’s a fine line with this one. Apply too much and you look like you’re sick; apply too little and it doesn’t make a difference. Proceed with caution. Thin liquid that’s easy to blend. Don’t use too much, or you’ll end up with it all over your face instead of dotted on spots and red patches. Stays put once it’s been set with powder. Works well with mineral foundation. It’s been discontinued as of 2018. Colour Corrector Kit looks like a similar alternative. I don’t have the patience to use this every day because of how careful you have to be, but it does minimise redness. I’m saving it for important occasions and nights out. Liquid concealer in a pen. You click the end to release more product and use the built-in brush to apply it. Not good, not bad. It has more peach tones than the other concealers listed here. Light, but because the liquid is so thin you can build it up if you’re careful. 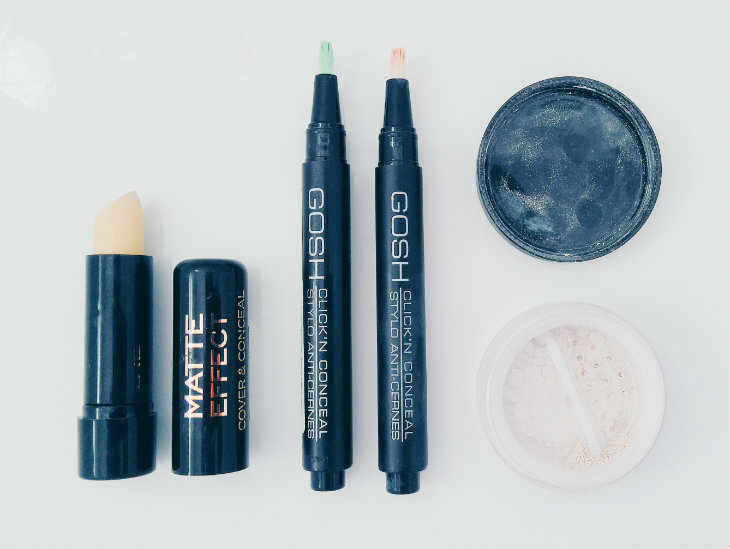 Like the Anti-Redness Concealer, it’s best to use a tiny bit at a time. Thin liquid, easy to blend. Good. Can just about survive a crazy night out. It’s been discontinued as of 2018. High Coverage Concealer in Ivory is a similar alternative. It’s good and I can make it work, but I wouldn’t buy it again because the shade match isn’t what I wanted. If GOSH made this in a lighter shade I’d buy it, so this is worth looking at if your skintone is warmer than mine. Mineral powder in a pot with a sifter. The lid is matte black with the Lily Lolo logo on it, which makes it look more expensive than it is. Perfect. This is very, very pale and doesn’t leave tell-tale marks on my skin like some darker concealers do. Ranges from sheer to medium, depending on how much you build up the layers. It’s best to work lightly and then add more if you need to. Blends in well over and under mineral foundation. Works best on spots (it sits in fine lines under the eyes). Apply with a fluffy concealer brush for the most natural-looking result. Makes it through the day. Could do with a touch-up at lunchtime but I wouldn’t use it on the go (I’d end up spilling the powder everywhere). Good if you want natural-looking coverage from a product that feels light on your skin. The pot is quite big, so it should last a long time even with daily use. Hmmm, this is a mixed bag. None of the concealers blew me away, but they all managed to get the job done in one way or another. The Lily Lolo concealer wins hands down on shade match, but the GOSH concealer stayed put for longer. If somebody could make a cruelty-free concealer that’s pale, long-lasting and under £10, that’d be wonderful. Anyone?